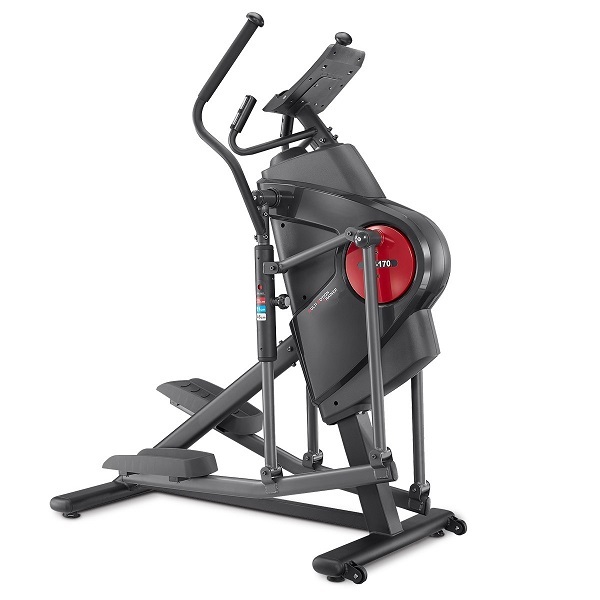 This is the ‘Space Saver’ 700 model and that fitting title gives the clue of why this machine may become very popular! 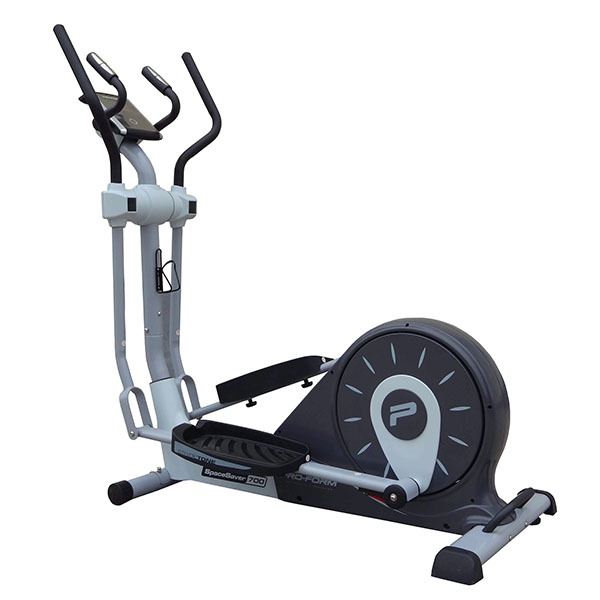 The patented folding mechanism of ProForm ellipticals is their crowning glory and a feature that truly sets them apart from all other rival brands. 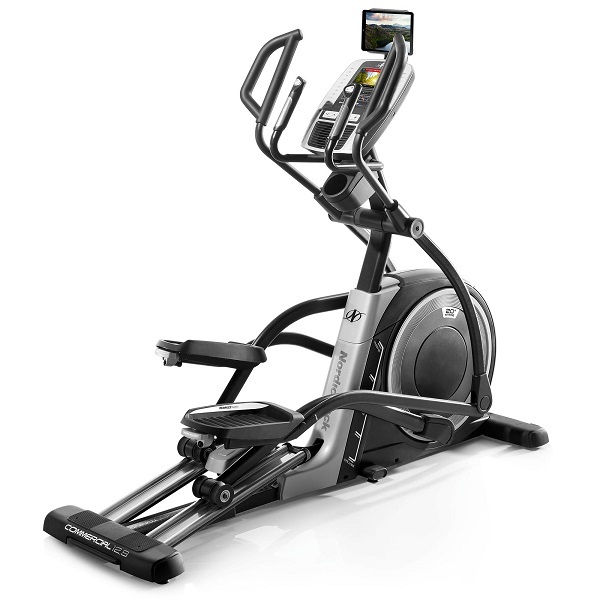 If you’re concerned that a decent sized elliptical trainer might require too much space and investment, just take a look at this!…. The ProForm 700 has a truly ingenious folding mechanism that is quick and easy to operate (once you know how)… There is a latch trigger under the end of each pedal arm that can release the sleeve from the crank arms, so that each one can be independently raised up until they make contact and ‘stick’ to magnets on the upper body arms. Once the pedal arms are securely held vertically out of the way, you simply pull out a safety pin from the flywheel body casing, and the whole thing can be pivoted on a hinge to sit up vertically. The safety pin is then reinstalled to lock the flywheel casing in it’s new upright position. In our opinion this is the most ingenious and effective folding system we have ever seen – there is nothing to rival it and Icon (the makers of ProForm) have got the patent leaving other manufacturers seemingly scratching their heads to think of an answer! The maximum user capacity is 115Kg (18 stone) and so we thought who better than to get our ‘largest’ reviewer Charlie Rawes to put it through it’s paces! Getting (very) close to the weight limit we noticed a fair amount of movement in the frame but overall the build quality and durability seems to be adequate, which is typical of a ProForm machine in that it ‘does the job’. 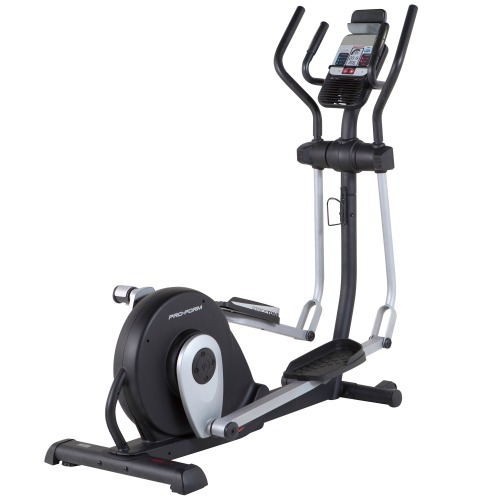 Rear wheel cross trainers (particularly under the £500 mark) often offer a rather bouncy elliptical motion in comparison to more expensive, refined machines. The ProForm 700 does have a respectably heavy flywheel (10Kg) and the fluidity of the momentum is fairly smooth as well as very silent. However, the motion itself is rather ‘choppy’, with a slightly bouncy action rather than a smooth arc. That said, it certainly isn’t an unpleasant motion or one that stresses the joints, so ProForm have got the biomechanics fairly right. Plus, by manually unscrewing 2 fixings under the pedals you can reposition the footplates into 3 different sets of holes which allows for users of different arm lengths to be positioned correctly relative to the moving arms. 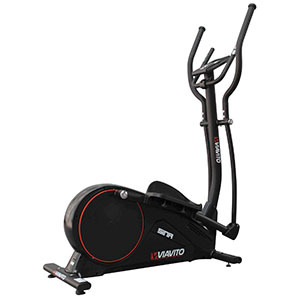 Resistance-wise, there are 16 levels and at the top end, your leg muscles get a taxing time, so this machine should offer some decent challenges to even experienced users. Moving up to the console, we see that ProForm have made some noticeable improvements to the display screen compared to past offerings. Previous models around this price range tended to offer loads in the way of gadgetry (iFit card slots, speaker systems and inbuilt fans etc) but the screens were often small and dull. It almost seemed they blew the budget on toys and compromised on the screen! If that was the case, then this time round they certainly seemed to invest resources more wisely! The screen measures 2.5″ by 5″ and is backlit with vibrant blue, with white digits and green LCD’s. Time, Speed, Resistance Level, RPM Distance, Calories and Pulse are all displayed in their individual areas along the bottom of the screen making for easy reading. The rest of the display is dedicated to showing whatever profile you are working on with plenty of green segments showing what’s in store too. The console can also save the personal data for up to 4 users (ideal for the whole family!) By storing your own personal details such as gender, age, weight and height into of the the 4 user-defined profiles, the machine will take these factors into account to give more accurate calorie consumption figures. For those wanting to monitor their weight loss progress, there is a Body Fat program. 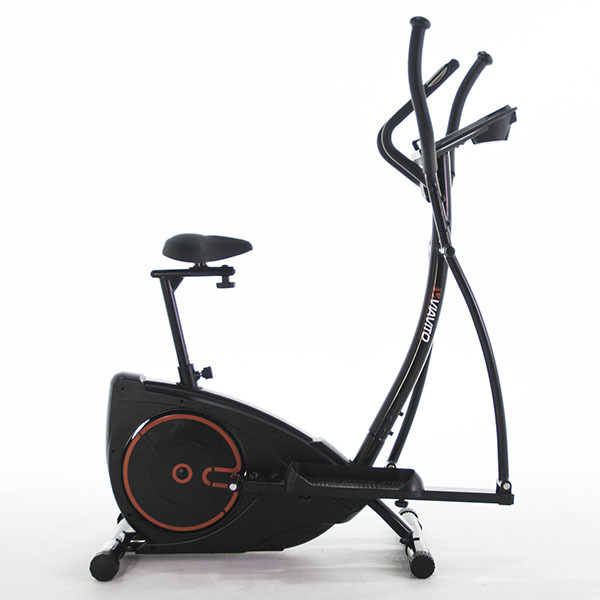 This feature utilises your inputted personal data and by holding onto the pulse grip sensors on the handlebars, the computer attempts to calculate your body fat percentage as well as your Body Mass Index (a measure for human body shape based on an individual’s weight and height). The 4 heart rate controlled programs only work by holding the pulse sensors (this machine is not wireless chest strap compatible) so the accuracy of the readings is severely compromised. Another drawback is that you need to keep hold of the static handles meaning that you cant work your upper body with the moving arms when doing heart rate control programs. The pulse sensors can also be used for a fitness test by pressing the ‘Recovery’ button once your workout is completed. You simply keep holding the pulse grips for the duration of a 60 second countdown and the computer will score how quickly your pulse begins to return to normal – from a score of one (outstanding!) to six(poor!). As we’ve said with the heart rate controlled programs (and in countless past reviews! ), pulse grip sensor reading should be taken as a ‘guide’ only – they are by no means reliable or accurate but these features are fun none-the-less, and any extra motivation or entertainment that can be derived from such features can only be a good thing in our book! The 12 pre-set programs offer some nice variety in terms of profiles. After you scroll through each (P1 – P12) the course profile flashes up on the screen showing what you can expect from each program. You can then alter the resistance, set the time from 1-99 minutes and even put a distance or calorie target to aim for. For further variety you have a User program which can be customised easily and quickly by using the swivel dial control. The custom session can also be saved for future use. As we mentioned earlier, this model isn’t loaded with the usual (sometimes superfluous) toys of ProForm models past. We see this as a good thing. Fan’s are often useless and take up valuable console space, so there isn’t one! There’s no MP3 connectivity or inbuilt speakers BUT the quality of sound can often be limited on machines of this caliber anyway, so if you’ve got an iPod or HIFI, we’re sure you wont miss this feature. What we are pleased to ‘see’ is a decent size screen and THAT is worth the sacrifice of most other gimmicks! 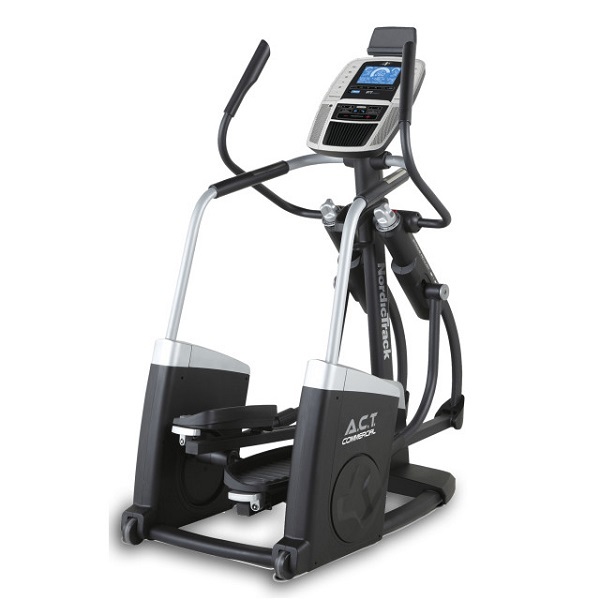 It’s hard to say if this machine is superior in many aspects to similarly priced rivals, but it certainly holds it’s own. However, in terms of ‘space saving’ the Space Saver 700, really is in a class of its own. 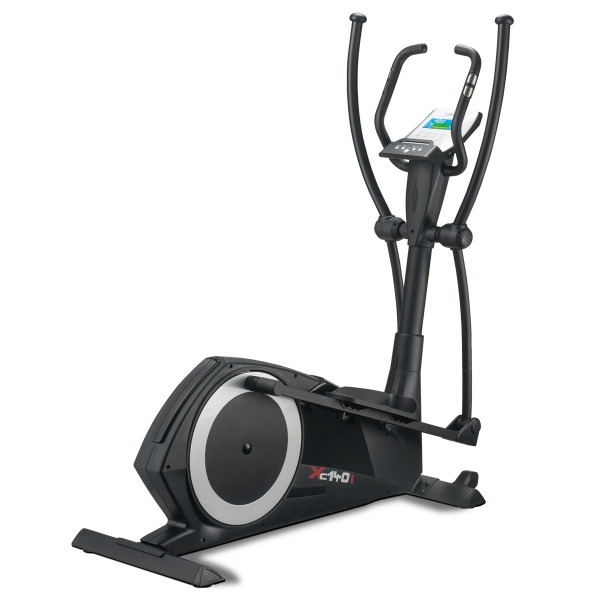 If in the past, you’ve struggled to justify floor space in the home for a decent sized cross trainer, The ProForm 700 may well be the answer. So for those with a limit on space, this could represent a very good solution. 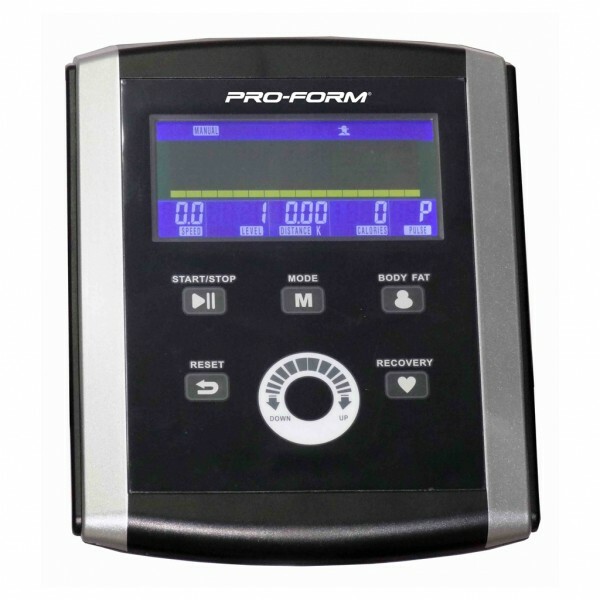 The Proform 700 is not currently available from any retailers we're aware of in the UK. 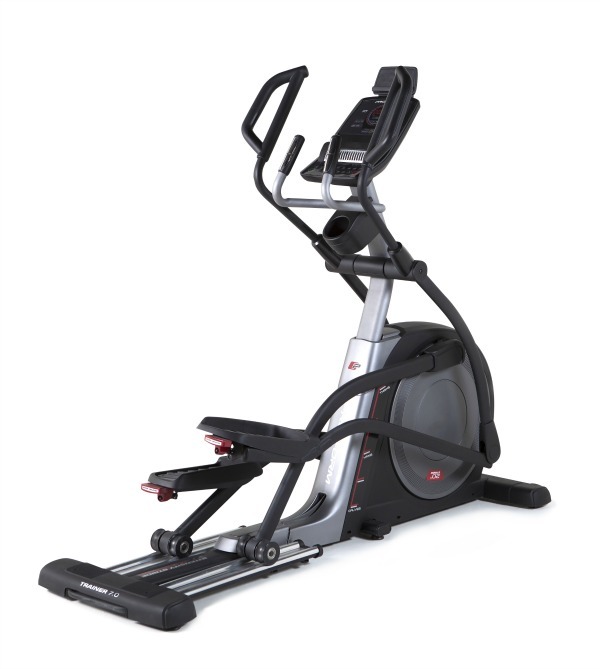 The ProForm 700 is an elliptical with a clear purpose: to fit the longest stride length possible into the smallest space possible when not being used. The folding mechanism achieves this and adds a touch of class with the soft-drop mechanism. 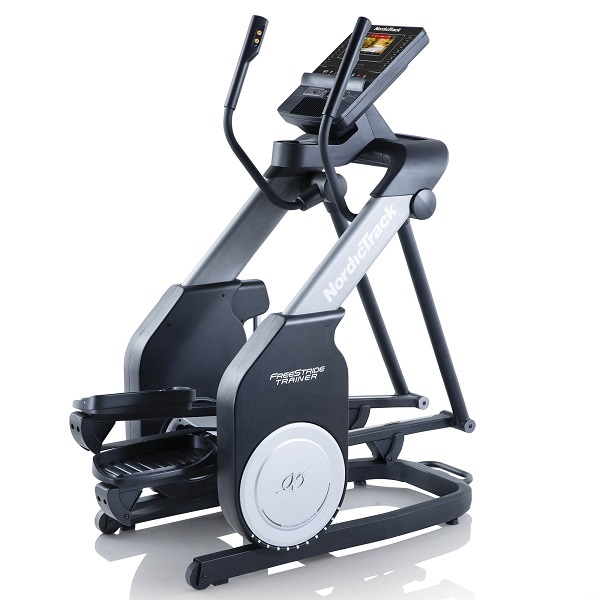 However, if the folding side of things isn't top of your priority list, then without doubt the HealthRider 1100 has a higher spec across board, is iFit Live compatible, and is available for £10 less.